Some days you just feel like baking, yesterday was one of those days. Before I went to get my hair cut, I decided to bake up a batch of cookies to take to my stylist. We’re friends, she is awesome at what she does and loves chocolate, so I decided double chocolate was in order. I admit, I am not a huge cookie fan, but over the last few months I have become a chocolate chip cookie fan and especially a warm from the oven double chocolate chip cookie fan. I know you are going to love theses cookies and your friends will too, enjoy and happy baking! Preheat your oven to 350º F. In medium bowl whisk together the flour, cocoa, baking soda and salt. In the bowl of your stand mixer beat the butter, sugars and vanilla extract until creamy. Add the egg and beat well. Slowly beat in the flour mixture. 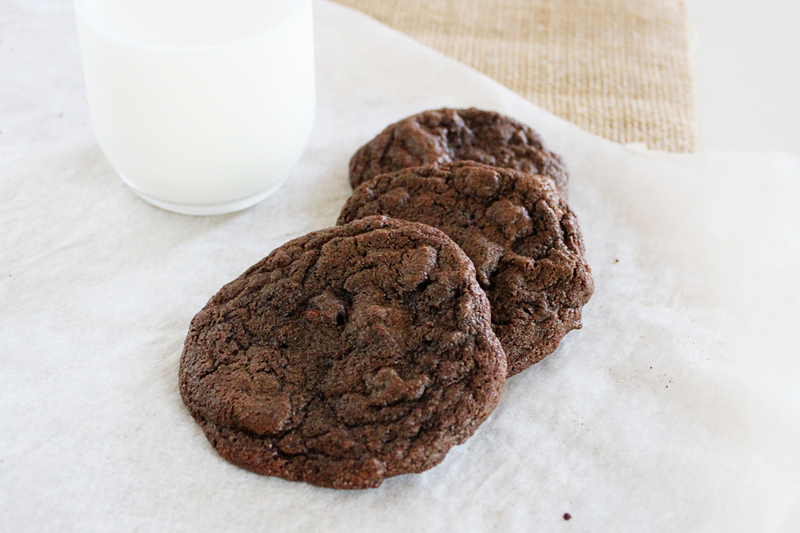 Stir in chocolate chips and spoon tablespoons of dough onto parchment lined baking sheets. Bake for 9 to 10 minutes, remove from the oven carefully and cool on pan for a few minutes;move to wire racks to cool completely. Congratulations! We really love reading your blog and you most definately deserve it! Two Chocolates?! Umm Yes please! I would love to have you come over and link up to my new Linky Party “Show Me Your Plaid Monday’s”! Yum! My family would love these 🙂 Thank you for sharing at All my Bloggy Friends this week! Thank you for linking up at Show Me Your Plaid Monday’s. I will be pinning each post to my Pinterest page so that all can see! I hope that you come back each week!